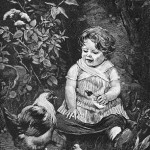 Our ever-growing collection of images of children with birds, comes from a variety of vintage illustrations that I found children’s books, magazines and other printed materials. 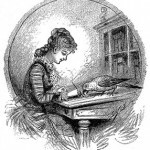 All of the children with bird drawings are in the public domain and can be freely used in your projects. If, you need copyright free bird drawings, be sure to also visit that section of Reusable Art. A friendly kiss between a young girl and her pet bird. 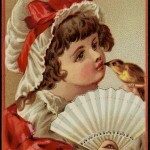 The yellow bird, a canary perhaps, appears to love his mistress who is wearing bright red and white. Vintage E. Boyd Smith drawing of a pair of children with a parrot. The kids are dressed for the beach and the girl is listening to the ocean in a seashell. 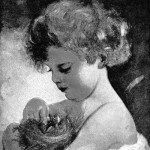 Drawing of a young child with a bird nest and hatchlings. 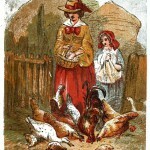 A young girl and her mother feed the chickens and ducks in this public domain drawing. 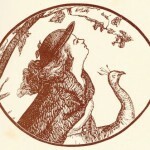 Vintage, one-color drawing of a little girl and a peacock. 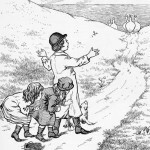 Three children and their dog are confronted by a gaggle of geese. 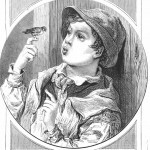 A young boy whistles to a little birdy. 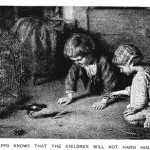 Two children visit with a pet bird in this copyright free children’s image. 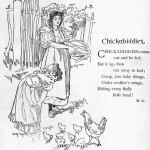 Charming vintage drawing of an infant surrounded by a hen and her chicks. 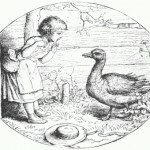 Drawing of a mean goose frightening a young girl. 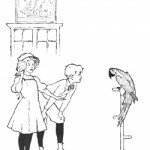 A parrot assists his mistress in this charming vintage drawing. Two young girls feed a mother hen and her chicks.